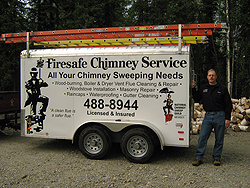 Firesafe Chimney Service Inc. was originally established in 1988 in Missouri. Its owner/president, Cary Freeman, decided to sweep chimneys as a part time job while in the military and going to college. Firesafe Chimney Service served the Kansas City, Missouri metropolitan area as well as Northwest Arkansas. In 1994 the owner moved to Alaska but continued to travel to the mid–west throughout the year to clean customers’ chimneys that had been loyal to him for several years. After retiring from the U.S. Marine Corps, Cary had more time to dedicate to chimney sweeping. So, in 2008 Cary decided to open Firesafe Chimney Service Inc. from North Pole, Alaska after understanding the huge need for qualified and knowledgeable chimney technicians in the Interior of Alaska. During this time, Cary retired from chimney sweeping in the mid-western part of the United States to concentrate on building his business in Alaska. Cary is certified by the Chimney Safety Institute of America (CSIA) and the National Fireplace Institute. Cary is also a member of the National Chimney Sweep Guild. Cary has a background in the construction trade to include: bricklaying, carpentry and electrical work. He has taken sheet metal fabrication and welding classes to further enhance his knowledge in these areas so that he may benefit his customers in a more robust way.